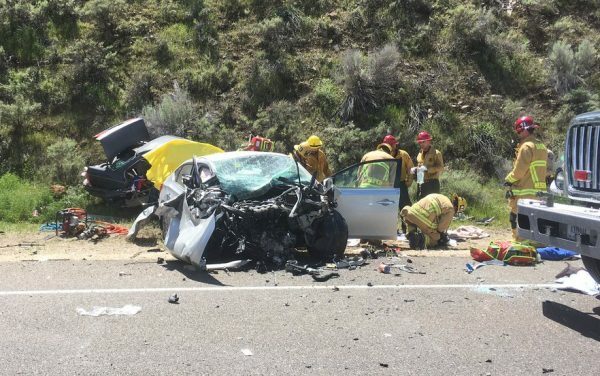 At about 12:30 p.m., Cal Poly art and design juniors Erica Kemp, Mariana Silverman, and Keilani Waxdeck were traveling eastbound in a black sedan in the Cuyama area when a Honda Accord drove around a blind curve, swerved over a solid yellow line, and crashed head-on into the Cal Poly students’ vehicle. Both the driver and the passenger in the Accord died at the scene of the crash. A Cal Star helicopter airlifted Waxdeck, who suffered major injuries, to Santa Barbara Cottage Hospital. As of Monday afternoon, Waxdeck is listed in critical condition. Kemp and Silverman suffered minor and major injuries respectively and were transported to Marian Regional Medical Center in Santa Maria. Kemp was driving the sedan, while Waxdeck was in the front seat and Silverman was in a backseat. Cal Poly’s Dean of Student’s Office has been in contact with the students and their families. CHP officers are investigating whether the driver of the Accord was under the influence of drugs or alcohol at the time of the crash.